﻿ Mahesh Babu Is Thrilled To See Himself Among Legends! Mahesh Is Thrilled To See Himself Among Legends! Legends of Indian Cinema like Amitabh Bachchan, Shah Rukh Khan, Aishwarya Rai, Sri Devi and several popular actors like Hrithik Roshan, Salman Khan have their wax statues in Madame Tussaud's around the world. In Singapore, Madame Tussaud's is planning to install South Indian legendary actors like Kamal Hassan, Rajnikanth, Mohan Lal and several other stars. They installed wax statue of Prabhas as Baahubali in Delhi and soon, they have plans to launch it in Singapore. 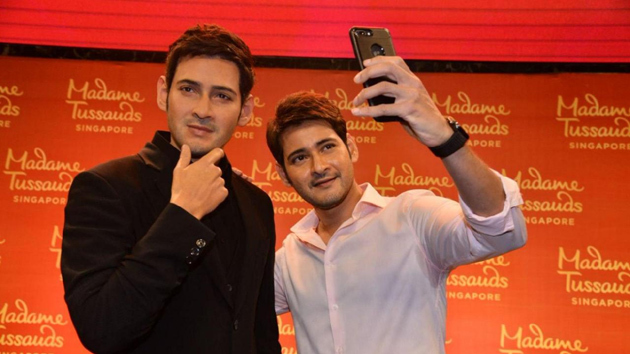 Before that, they launched Mahesh Babu's wax statue in Singapore Museum. They unveiled the statue in AMB Cinemas, on 25th March. Mahesh expressed his delight saying, "The statue is freaking me out, because it is very real, and it can't get any better than this." He further added, "It's an honor that I've got my wax sculpture and it will be placed alongside many legends of Indian cinema in Singapore. There couldn't be more happiness than this. Six years ago I went to London with family and then visited Madame Tussauds there. Then I felt, one day even I should also have my statue erected and today here we are"
Namrata joked that she has two husbands now and Sitara, their daughter is stunned to see wax statue of her father. Chi La Sow Traditional Girl Goes Truly Wild! Are Photoshoots Not Helping Eesha? Talk Of Town: Ramoji Rao Granddaughter Marriage!